1 A None No Power Seat 1 A is a standard Business Class bulkhead seat, although proximity to the galley may be bothersome. 1 C None No Power Seat 1 C is a standard Business Class bulkhead seat, although proximity to the galley may be bothersome. 1 D None No Power Seat 1 D is a standard Business Class bulkhead seat, although proximity to the galley may be bothersome. 11 A None No Power Seat 11 A is a bulkhead seat, although proximity to the lavatory and galley may be bothersome. The tray table is in the armrest, making the armrest immovable and slightly reducing seat width. There is no floor storage for this seat during take-off and landing. 11 B None No Power Seat 11 B is a bulkhead seat, although proximity to the lavatory and galley may be bothersome. The tray table is in the armrest, making the armrest immovable and slightly reducing seat width. There is no floor storage for this seat during take-off and landing. 11 C None No Power Seat 11 C is a bulkhead seat, although proximity to the lavatory and galley may be bothersome. The tray table is in the armrest, making the armrest immovable and slightly reducing seat width. There is no floor storage for this seat during take-off and landing. 11 D None No Power Seat 11 D has extra legroom due to the position of the bulkhead, although proximity to the lavatory and galley may be bothersome. The tray table is in the armrest, making the armrest immovable and slightly reducing seat width. There is no floor storage for this seat during take-off and landing. 11 F None No Power Seat 11 F has extra legroom due to the position of the bulkhead, although proximity to the lavatory and galley may be bothersome. The tray table is in the armrest, making the armrest immovable and slightly reducing seat width. There is no floor storage for this seat during take-off and landing. 11 G None No Power Seat 11 G has extra legroom due to the position of the bulkhead, although proximity to the lavatory and galley may be bothersome. The tray table is in the armrest, making the armrest immovable and slightly reducing seat width. There is no floor storage for this seat during take-off and landing. 11 H None No Power Seat 11 H is a bulkhead seat, although proximity to the lavatory and galley may be bothersome. The tray table is in the armrest, making the armrest immovable and slightly reducing seat width. There is no floor storage for this seat during take-off and landing. 11 J None No Power Seat 11 J is a bulkhead seat, although proximity to the lavatory and galley may be bothersome. The tray table is in the armrest, making the armrest immovable and slightly reducing seat width. There is no floor storage for this seat during take-off and landing. 11 K None No Power Seat 11 K is a bulkhead seat, although proximity to the lavatory and galley may be bothersome. The tray table is in the armrest, making the armrest immovable and slightly reducing seat width. There is no floor storage for this seat during take-off and landing. 12 D None No Power Seat 12 D is an Economy seat, however this seat has limited under-seat leg and storage room due to the presence of an entertainment equipment box. 13 D None No Power Seat 13 D is an Economy seat, however this seat has limited under-seat leg and storage room due to the presence of an entertainment equipment box. 14 D None No Power Seat 14 D is an Economy seat, however this seat has limited under-seat leg and storage room due to the presence of an entertainment equipment box. 15 D None No Power Seat 15 D is an Economy seat, however this seat has limited under-seat leg and storage room due to the presence of an entertainment equipment box. 16 D None No Power Seat 16 D is an Economy seat, however this seat has limited under-seat leg and storage room due to the presence of an entertainment equipment box. 17 D None No Power Seat 17 D is an Economy seat, however this seat has limited under-seat leg and storage room due to the presence of an entertainment equipment box. 18 D None No Power Seat 18 D is an Economy seat, however this seat has limited under-seat leg and storage room due to the presence of an entertainment equipment box. 19 D None No Power Seat 19 D is an Economy seat, however this seat has limited under-seat leg and storage room due to the presence of an entertainment equipment box. 20 D None No Power Seat 20 D is an Economy seat, however this seat has limited under-seat leg and storage room due to the presence of an entertainment equipment box. 21 D None No Power Seat 21 D is an Economy seat, however this seat has limited under-seat leg and storage room due to the presence of an entertainment equipment box. 22 D None No Power Seat 22 D is an Economy seat, however this seat has limited under-seat leg and storage room due to the presence of an entertainment equipment box. 23 D None No Power Seat 23 D is an Economy seat, however this seat has limited under-seat leg and storage room due to the presence of an entertainment equipment box. 24 D None No Power Seat 24 D is an Economy seat, however this seat has limited under-seat leg and storage room due to the presence of an entertainment equipment box. 25 D None No Power Seat 25 D is an Economy seat, however this seat has limited under-seat leg and storage room due to the presence of an entertainment equipment box. 27 A None No Power Seat 27 A has limited recline due to the wall behind. Proximity to the lavatory and galley may be bothersome. 27 B None No Power Seat 27 B has limited recline due to the wall behind. Proximity to the lavatory and galley may be bothersome. 27 C None No Power Seat 27 C has limited recline due to the wall behind. Proximity to the lavatory and galley may be bothersome. 27 D None No Power Seat 27 D is an Economy seat, although proximity to the lavatory and galley may be bothersome. This seat has limited under-seat leg and storage room due to the presence of an entertainment equipment box. 27 G None No Power Seat 27 G is a standard Economy seat, although proximity to the lavatory and galley may be bothersome. 27 H None No Power Seat 27 H has limited recline due to the wall behind. Proximity to the lavatory and galley may be bothersome. 27 J None No Power Seat 27 J has limited recline due to the wall behind. Proximity to the lavatory and galley may be bothersome. 27 K None No Power Seat 27 K has limited recline due to the wall behind. Proximity to the lavatory and galley may be bothersome. 28 D None No Power Seat 28 D has limited recline due to the wall behind. Proximity to the lavatory and galley may be bothersome. This seat has limited under-seat leg and storage room due to the presence of an entertainment equipment box. 28 F None No Power Seat 28 F has limited recline due to the wall behind. Proximity to the lavatory and galley may be bothersome. 28 G None No Power Seat 28 G has limited recline due to the wall behind. Proximity to the lavatory and galley may be bothersome. 29 A None No Power Seat 29 A has extra legroom due to the exit row, although proximity to the lavatory and galley may be bothersome. The tray table is in the armrest, making the armrest immovable and slightly reducing seat width. There is no floor storage for this seat during take-off and landing. 29 B None No Power Seat 29 B has extra legroom due to the exit row, although proximity to the lavatory and galley may be bothersome. The tray table is in the armrest, making the armrest immovable and slightly reducing seat width. There is no floor storage for this seat during take-off and landing. 29 C None No Power Seat 29 C has extra legroom due to the exit row, although proximity to the lavatory and galley may be bothersome. The tray table is in the armrest, making the armrest immovable and slightly reducing seat width. There is no floor storage for this seat during take-off and landing. 29 H None No Power Seat 29 H has extra legroom due to the exit row, although proximity to the lavatory and galley may be bothersome. The tray table is in the armrest, making the armrest immovable and slightly reducing seat width. There is no floor storage for this seat during take-off and landing. 29 J None No Power Seat 29 J has extra legroom due to the exit row, although proximity to the lavatory and galley may be bothersome. The tray table is in the armrest, making the armrest immovable and slightly reducing seat width. There is no floor storage for this seat during take-off and landing. 29 K None No Power Seat 29 K has extra legroom due to the exit row, although proximity to the lavatory and galley may be bothersome. The tray table is in the armrest, making the armrest immovable and slightly reducing seat width. There is no floor storage for this seat during take-off and landing. 30 D None No Power Seat 30 D has limited legroom due to the position of the bulkhead. Proximity to the galley may be bothersome. The tray table is in the armrest, making the armrest immovable and slightly reducing seat width. There is no floor storage for this seat during take-off and landing. 30 F None No Power Seat 30 F has limited legroom due to the position of the bulkhead. Proximity to the galley may be bothersome. The tray table is in the armrest, making the armrest immovable and slightly reducing seat width. There is no floor storage for this seat during take-off and landing. 30 G None No Power Seat 30 G has limited legroom due to the position of the bulkhead. Proximity to the galley may be bothersome. The tray table is in the armrest, making the armrest immovable and slightly reducing seat width. There is no floor storage for this seat during take-off and landing. 36 D None No Power Seat 36 D is an Economy seat, however this seat has limited under-seat leg and storage room due to the presence of an entertainment equipment box. 37 D None No Power Seat 37 D is an Economy seat, however this seat has limited under-seat leg and storage room due to the presence of an entertainment equipment box. 38 D None No Power Seat 38 D is an Economy seat, however this seat has limited under-seat leg and storage room due to the presence of an entertainment equipment box. 38 H None No Power Seat 38 H juts into the aisle and is often bumped by service carts and other passengers during flight. 39 D None No Power Seat 39 D is an Economy seat, however this seat has limited under-seat leg and storage room due to the presence of an entertainment equipment box. 40 D None No Power Seat 40 D is an Economy seat, however this seat has limited under-seat leg and storage room due to the presence of an entertainment equipment box. 41 B None No Power Seat 41 B is a standard Economy seat, although proximity to the galley may be bothersome. 41 D None No Power Seat 41 D is an Economy seat, although proximity to the galley may be bothersome. This seat has limited under-seat leg and storage room due to the presence of an entertainment equipment box. 41 G None No Power Seat 41 G is a standard Economy seat, although proximity to the galley may be bothersome. 41 J None No Power Seat 41 J is a standard Economy seat, although proximity to the galley may be bothersome. 42 A None No Power Seat 42 A has limited recline and proximity to the galley may be bothersome. 42 B None No Power Seat 42 B has limited recline and proximity to the galley may be bothersome. 42 D None No Power Seat 42 D has limited recline and proximity to the galley may be bothersome. This seat has limited under-seat leg and storage room due to the presence of an entertainment equipment box. 42 F None No Power Seat 42 F has limited recline and proximity to the galley may be bothersome. 42 G None No Power Seat 42 G has limited recline and proximity to the galley may be bothersome. 42 J None No Power Seat 42 J has limited recline and proximity to the galley may be bothersome. 42 K None No Power Seat 42 K has limited recline and proximity to the galley may be bothersome. 5 A None No Power Seat 5 A is a standard Business Class seat that has a misaligned window and the proximity to the galley may be bothersome. 5 C None No Power Seat 5 C is a standard Business Class seat, although proximity to the galley may be bothersome. 5 D None No Power Seat 5 D is a standard Business Class seat, although proximity to the galley may be bothersome. 5 F None No Power Seat 5 F is a standard Business Class seat, although proximity to the galley may be bothersome. 5 G None No Power Seat 5 G is a standard Business Class seat, although proximity to the galley may be bothersome. 5 H None No Power Seat 5 H is a standard Business Class seat, although proximity to the galley may be bothersome. 5 K None No Power Seat 5 K is a standard Business Class seat that has a misaligned window and the proximity to the galley may be bothersome. ANA flies two versions of its B777-200ER aircraft. This version offers two classes of service: Business and Economy. This aircraft is used for intra-Asia flights. There is a box that partially blocks the legroom of this seat. The seat is old. LCD screen is old. The seat is not soft. I just wanted to point out that there is a box that partially blocks the legroom of this seat. Generally it is a cramped seat. Hard to justify using this plane for flights beyond japan. Row 1 has good legroom but nothing else to recommend it. Old clunky video from armrest popout. No storage below seat or cubby...and unless you board early, others may take overhead storage. Recline is so 1999. As others have commented, these planes are old and worn. 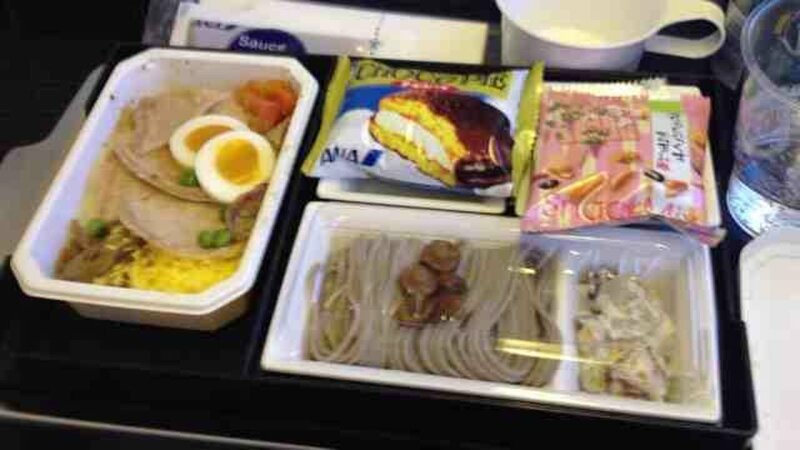 On my recent NRT-BKK flight, the seat pitch and width were barely tolerable. 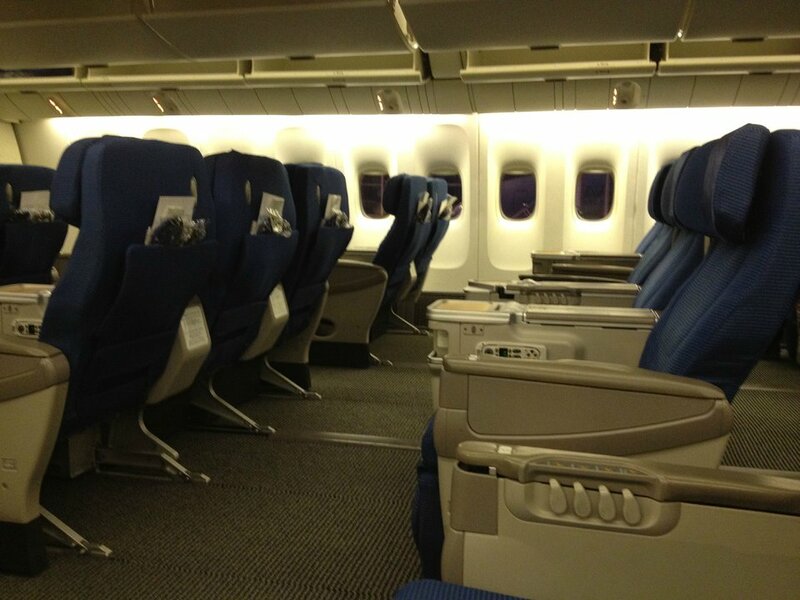 Note that the middle seats in Economy (B, F, and J), are noticeably wider than the aisle or window seats. These planes are long in the tooth. Business Class is a trip back to 1999. Economy Class seats are thick and uncomfortable. Seatback entertainment is substandard (difficult to watch tiny screens). Food and service are up to ANA's usual high standards. It was a good seat. There wasn't too much traffic although the bathroom was really close. We got our meals served very quickly.